We sincerely thank Vaastu Social Foundation for hep with fund raising. We sincerely thank all the donors including Vaastu Social Foundation . We will be sharing details of the Bank account in Goa soon. We are closing the one in Dehradun. If you wish to donate, please feel free to send an email to the National Coordinator (Harish). If you can translate self help material in regional languages, or convert them in podcasts, please get in touch. If you are good at animation, you can produce animation stories (based on Seven stories, Izabella etc.). Let us know, if you have any such creative ideas after looking at resources. While TISA will continue to offer its services for “free” as a sewa always, your donation – however small – will help us to reach out to a larger group of people. We want to do many more Communication workshops, more events to tell people and children who stammer, that they are not alone and a lot can be done on self-help basis, more translations and media production for a wider audience etc. The trust has two trustees – Dr Satyendra Srivastava and Mr Parmanand Dhiman, who have been associated with this movement from the early days in Herbertpur, Dehradun. There is a advisory body consisting of current and past national coordinators: Mr Manimaran (Chennai), Mr JP Sunda (Chandigarh) and Mr Harish Usgaonkar (Goa). 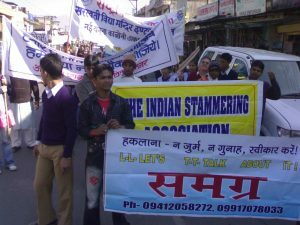 If you ever wish to know how your contribution is helping TISA to reach out to Indian people who stammer, just drop us an email. You can also help by sharing other resources: your time and inspiration above all. By helping as volunteers – listening, peer counseling, helping in organising / setting up self-help groups and other events; reading posts and leaving encouraging comments; translating our posts and other media (like TISA self help manual) in regional languages; inviting us to your school / office to facilitate an open session on stammering and what can be done about it by society etc. No end to your creativity and positive impact on someone. Get in touch if you have such an idea..